This won’t be a long post because frankly, YOU KNOW WHAT TO DO! Today is the day to show off that great pedicure with your favorite flip flops! Summer doesn’t begin officially until the 21st, but wearing your flip-flops lets everyone know you are ready and waiting for hot weather and cool pools. Go to the beach and stick your toes in the sand… sounds great, doesn’t it? At the very least we need to get away from all the horrific events that have taken place in recent days. Run away from the television, radio, computer and any other media source. I don’t know about anyone else, but I’m so sick of hearing about politics in this election year – as well as shootings and other sad situations reported in the news lately. Since today is Friday, I thought it would be fun to show you some FRIDAY FACES. If you have to ask what a Friday Face is, then you obviously have not had to endure a job you hated for a long time. A Friday Face is that look of pure joy that washes over you when you realize that you have finally completed a week and will have two days all to yourself to do what you really enjoy doing. There are many weekend warriors out there – I have been in the ranks in my life. For the most part I enjoyed my work, but there were a couple of jobs that I didn’t think I’d survive – yet with God’s help, I did. Happiness really is an inside job! We have choices to enjoy the ones we live with or spend time fussing with them. I choose to enjoy my loved ones because life is just way too short (so am I, but we’ll save that subject for another post). Here’s my FRIDAY FACE! Here’s my FRIDAY FACE! Bring on the weekend… I’m sleepin’ in! LOL… a different Friday in a different year. 🙂 Spa days are so much fun!!! She’s just a little ready for the weekend… I’d say so! I can dig the pig in the tote… say that five times fast… LOL!!! During the week he wears shined shoes with an expensive suit and tie. This weekend he will put on hiking boots and work off some stress on a familiar trail that seems to be calling his name. This is the man he really is, not the stuffed shirt people see during the week. By Monday he will be ready to do what they pay him to do, but he won’t think about that until Sunday night. He’s a good man and does what he has to do to take care of his family – but he dreams of a time in life when he can live in the hiking boots and walk the trail anytime he wants to seek adventure outdoors. She works in a flower shop all week inside a local grocery store. Every Friday she puts a freshly cut flower in her hair, thanks God for seeing her through yet again and leaves the store with a big grin on her face, knowing that she has the weekend to recharge her batteries so she can get up on Monday morning and do it all over again. Yes I know there are so many things on your mind right now. The election and other assorted divisive issues have all of us feeling a burden like never before. But for today – just for this one Friday… I want to let it go – give it all to GOD – and bask in the blessings from God – on this day and in this weekend. Marian’s photo reminded me that we need to take moments with our family members – and laugh – and take selfies to post on facebook! YES!!! Karley holding her mammoth cabbage… wow!!! I have the most COOL facebook friends!!! Can you believe the size of this cabbage??? She posted this photo the other day and of course it got me to thinking about how much BIGGER our blessings are when we belong to God. Bigger blessings??? You bet! God has blessed His own in a big way since the beginning of time. Have you ever heard the saying… I’m too blessed to be stressed – ??? It’s true! When we focus on all of the many blessings from the LORD, we just spend time loving our family and friends – instead of thinking about the things we lack. With God in our corner, we lack nothing. We have what we need because we know He provides for our every need. You know, if there is something you think you need and God has not brought it your way (like, say… a million dollars) – it’s because He knows it’s not what you need. How many times do we hear about folks who win the lottery and have nothing but grief after they get all that money? I’ve heard story after story about tragedy that stems from having too much money and being used – or some even lose their life over it. God wants the very best for us – we have to trust His wisdom for our lives. Money doesn’t solve every problem – it really doesn’t. 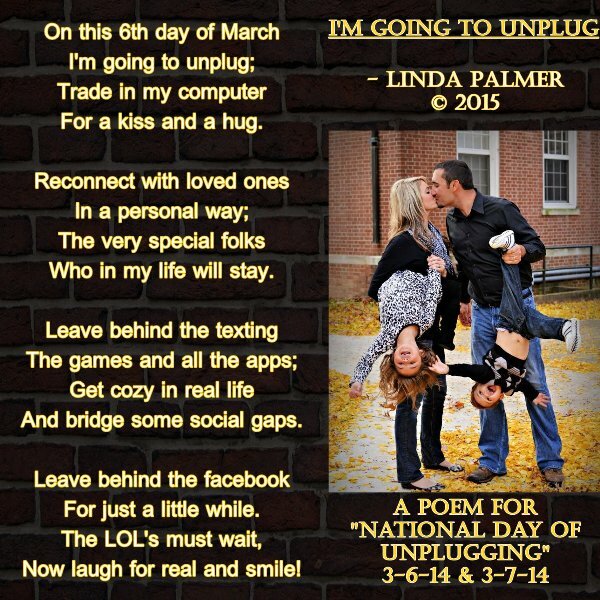 Today is the NATIONAL DAY OF UNPLUGGING. For 24 hours we are encouraged to lay down all technology and do something that we are unaccustomed to… REST! I am a firm believer in rest – naps – relaxing – taking a break. So… I am writing this post now (in January) to let you know I will be resting for the next 24 hours. There won’t be a post tomorrow, but I will return with a new post on March 8th. Maybe you can catch up with a Stephen King novel. Hmm… if it’s dark, maybe not. What do you need to do? Well, I suggest you stop reading this and go REST. Rest your thumbs so they don’t get arthritis prematurely. Take a walk and leave your cell phone at home. No texting. If you turn your laptop and desktop off completely then you’ll be less tempted to check email or anything else. Will you celebrate this time of rest with me? Thinkin’ this guy won’t. How much more dependent on technology are we in 2015 than we were in 2014? Is it getting worse? Is it a generational thing? Well, of course it is! When I was a kid I knew how to entertain myself with some of my dad’s old boards, some glue and some of my mom’s leftover yarn! I used to sit for hours at the kitchen table, creating abstract works of art with these mediums! Some of them were really quite GROOVY! LOL!!! The young people were born into technology and cannot imagine having to use their own imaginations to entertain themselves. It’s all about communication with them! The bad news is, they don’t have much inner vision. The good news is, we are raising great communicators!!! That’s not a bad thing in the workplace! Today is SUMMER COOL-OFF DAY!!! In 1630, lemonade was invented in Paris. That’s certainly one way to stay cool this summer. These awesome photos on my poem were taken by my friend, Ian. He is fortunate enough to live close to a beach. Of course, going to a beach is on my bucket list. One day I will get there, Lord willin’ and the creek don’t rise. It’s obvious his dogs enjoy going to the beach to frolic and play. Our beagle mix, Casey, is too old to frolic much anymore, but he still enjoys a good walk around the neighborhood. No matter where we live, we all like to take our pets out for some exercise because it’s good for them. I care for Casey by using a homemade flea shampoo. Most bottled dog shampoos have added toxins that could hurt him, so I make my own. Massage in and leave for 5 minutes before rinsing clean. We try to feed Casey the most healthy food, but it’s fun to make treats for him! In a separate large bowl, whisk together the eggs, pumpkin and peanut butter until combined. Stir wet ingredients into dry. Pour onto a floured surface and roll dough out to 1/2 thick. Cut out using cookie cutter. The dough will be a little sticky, a dusting of flour for your hands and the rolling-pin will help! Bake for 30 to 35 minutes until golden brown. Place on cooling racks and let cool thoroughly. They will harden as they cool. *These are the treats that are pictured. *1/2 tsp of salt can be added to these treats to help extend the shelf life but, it is optional. *Cinnamon is fine to use in recipes for dogs, however do not use a pumpkin spice blend or anything that could contain nutmeg. It is toxic to dogs and even in small amounts can make them sick. I need to share one more heart-warming video. OK, two more… LOL! The popular phrase I used to hear in the workplace was, “Efficiency is the RULE and speed is the TOOL.” Because many of us work toward that goal every day, we find it difficult to take it down a few notches after we punch the clock at night. I want to challenge you to do something different today. When you get off work, take a few deep breaths and tell yourself you are on YOUR time now – and slow down!!! Yes – slow down! When was the last time you took a walk along a nature trail? I’m not talking about walking for your health, but just a leisurely walk in the woods to get closer to nature? There is no better way to relax than to slowly stroll along a hiking trail and see animals in their natural habitat. You may not think there are any nature trails close to your work or home. You might be surprised! Even if you live in a large City, as I do – there may be some spots to go relax. We have a nature trail less than five miles from our house. It’s a great place to escape from the frenzy of life for a while! I take my camera out with me. When I’m trying to get a good shot of an animal, that forces me to walk at a slower pace yet. Animals, unlike people, do not demand to have their photo taken! There is a time and place for power walking and getting your heart rate up – no doubt. But today I hope you will take some time to just saunter along – your camera hung around your neck – waiting for nature to come out and pose for you. One day I hope to be sauntering along a beach, taking photos of lighthouses. It won’t be this year, but hopefully some day I’ll get to see a beach and a large body of water! It’s on my bucket list. 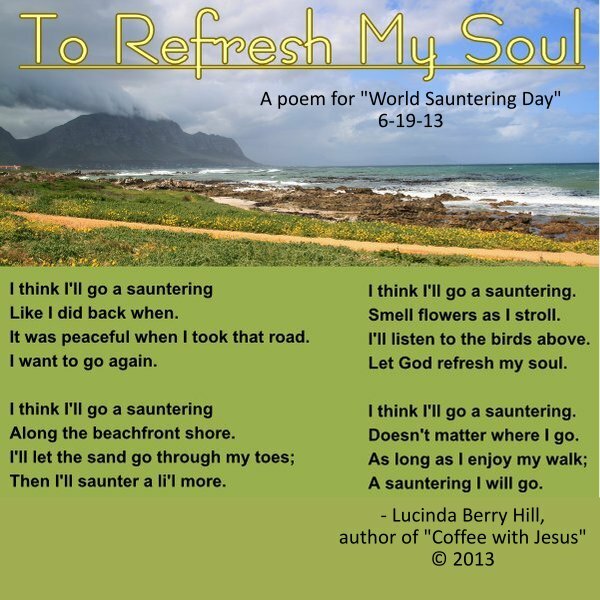 My friend Lucinda Berry Hill wrote a wonderful poem about sauntering.